I stand by the sizzling tawa pouring the batter and swirling it into a geometric shape. You stand by my side on a little chair, the top of your head nuzzled against my side. My left arm is positioned across your trunk protectively to keep the heat and oil from getting to you. You lean on me, inhale deeply and let out a sigh that reeks of contentment and simple joy. We stand side by side as I talk to you about how I grew up doing little things for my mom. Your grandma. You nod as if you understand. Even as the pile of dosa grows and you are done with your milk and skip off to play, my mind recognizes the moment for what it is. Long after you are grown up and gone, long before you can isolate smells and remark on associations, you will know each time you smell ghee and feel warm that you are home. The hazy fumes in the early morning will register in your consciousness as the comfort and security that a home means. You will be older and may not seek out the warmth of your mother early in the morning but the smells and sounds of home will entwine themselves in your head making you carry your home with you. Wherever you go. That my little one, is all I aspire for. Next Will you be a Secret Santa? The crispy dosas and your writing! 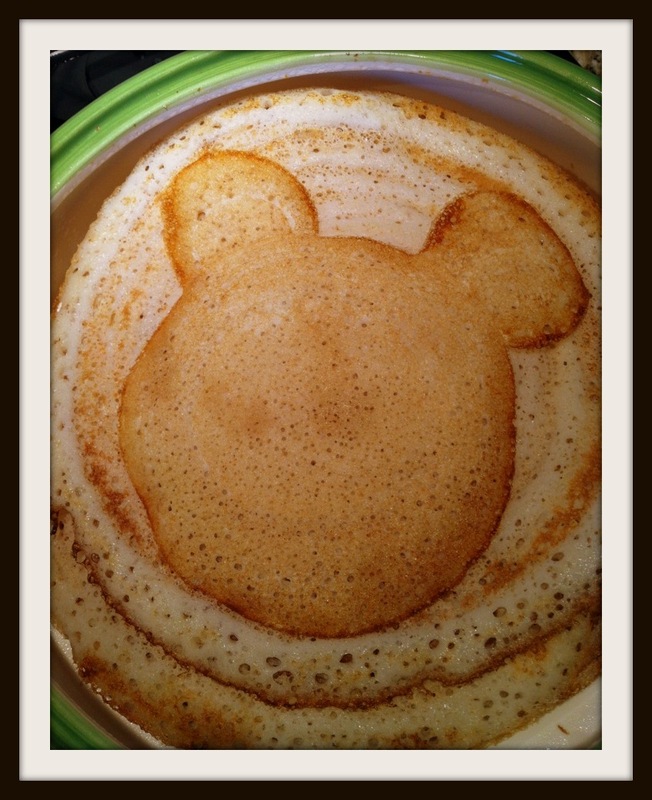 I make whole wheat & almond flour pancakes every Saturday morning in mickey/teddy bear shapes . . . so your photo warmed my heart. I love how cooking creates family bonds.